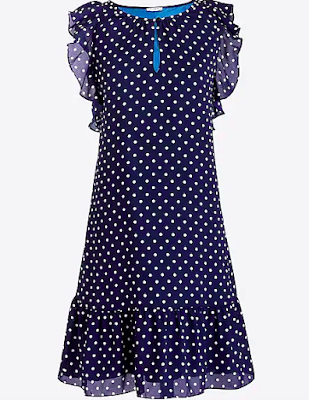 This ruffle dress is so gorgeous and feminine, and the polka dot pattern gives in a classic and retro vibe. The navy and white make this dress perfect for the 4th of July, paired with a red lipstick or red statement earrings. With a cardigan on top it could be work appropriate, depending on your office dress code. I love a high-quality simple white tee. It's so versatile, and looks great with fun patterned shorts, skirts, and pants. I love the grosgrain details on the sleeves of this tee, it really elevates it and makes the shirt more fun. This would be great to wear with gingham pants, or Lilly Pulitzer patterned shorts. It's a great closet staple. I love this new sailboat print from Lilly Pulitzer. It's such a beautiful preppy summer print. I picture someone wearing this out and about while vacationing in Newport, Nantucket, Martha's Vineyard, or Cape Cod. I love the color palette of the dress. The lilac color is so pretty and soft, and goes great with the different shades of blue. 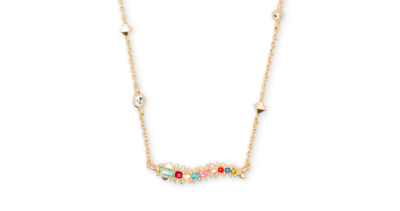 This bright and colorful necklace is the perfect touch of summer fun to any outfit. The different colored gemstones make it so versatile, it can be paired with almost any outfit. The pendant is small enough that the bright colors will still come off as simple, and won't overwhelm any outfit.